The inventor has announced a surprise move into the haircare industry. While everyone's been busy speculating about Dyson's secret electric car, it seems the company was beavering away to bring another surprise product to market. 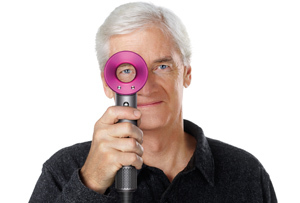 James Dyson has dabbled in snazzy vacuum cleaners, eye-wateringly powerful hand dryers and fans without blades. But now he’s turned his attentions to the humble hairdryer, launching the Dyson Supersonic – yours for £299. A price that might be enough to get your eyes watering all over again. As far as MT can see, that £299 price tag makes the Supersonic at least twice as expensive as most of the salon-grade equivalents out on the market already. Many people may spend a lot to take care of their hair, but £300 is a pretty steep amount to expect folks to invest in a hairdryer. The tech may well be good, but it won't be easy to waltz in and grab a share of the market. He's done his homework though. The Supersonic took four years and £50m to develop and has been tested on over 1,000 miles of real human hair - enough to make Rapunzel jealous. Though £50m might be a fair thwack for creating a hairdryer, it’d still be pocket change for Dyson himself (of course he’s unlikely to need a Supersonic for his short, silvery locks). He’s one of 117 UK-based billionaires on The Sunday Times Rich List and at the most recent count his net worth was a princely £5bn, climbing the ranks from 22 last year to 17 on the list. And his company's performance isn't too shabby either. Last month Dyson said its sales were up by over a quarter to £1.7bn, boosted by a tripling of sales in China, and profit rose 19% to £448m. The move into haircare is another indicator Dyson isn’t afraid to have his fingers in many pies. The company has committed a £1.5bn investment in future technology and works with over 30 universities developing early-stage technologies, including a £5m joint robotics lab with Imperial College London. Dyson might have started inventing over twenty years ago, but his appetite for innovation is showing no signs of slowing.